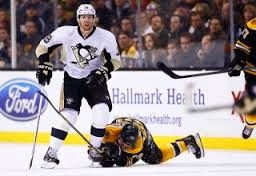 By now any hockey fan has read 2 or 18 articles that covered Shawn Thornton’s assault on Brooks Orpik. Everyone has an opinion on what occurred, who should have done what and when they should have done it. Speculation on discipline and fan comments filled blogs, Twitter, website comments and actual pages that still use ink. But who was really at fault here. I think that it’s important to analyze any situation that goes wrong, particularly those that have such a negative impact on the integrity of hockey and the NHL. You want to isolate the symptoms from the root cause in an effort to learn from an ugly incident and avoid a repeat. Just as the NHL has learned from McSorley – Brashear and Bertuzzi – Moore (and hundreds of lessor acts of thuggery) I am confident that they will study this latest event and quickly take action to protect the reputation of the league and the sport. You would expect no less from any professional sports association. It may be obvious that the majority of fault lies with Thornton. Clear video evidence filled the internet showing his slew footing and sucker punching of a defenseless Orpik. Despite an apology during post-game interviews it was obvious that the majority of public opinion categorized his act as stupid and not something that should be part of anyone’s vision of hockey. Anti-fighting media and fans pointed to it as another example of the NHL ignoring the dangers of allowing enforcers in the game. Many tried to separate Thornton’s actions from the fighting debate, calling it an assault and that it had nothing to do with dropping the gloves. Except Thornton directly connected the dots by trying to engage Orpik in a fight prior to the assault and talked about his job as an enforcer in the post-game interview. He was frustrated that he couldn’t fulfill his role of defending a teammate and a one-sided fight was the result. There were those that stated that if Orpik had not refused to fight Thornton then the incident would have never happened. Does that mean that any player has to answer for a bodycheck or risk being blind-sided and pummelled with the potential of being taken off the ice on a stretcher? Orpik plays 20+ minutes a night against the top lines while Thornton averages a little more than 8 minutes. So top players have to drop the gloves and put their teams at a disadvantage? You have to wonder where to draw the line. Enforcers are challenging opponents to answer for cheap shots, to answer for dangerous hits, to answer for clean checks, to answer for celebrating goals or simply for because their opponent is up by 3 or 4 goals late in a game. That’s a lot of answering to be done and no one is questioning how ridiculous it has become or the fact that none of this “policing” seems to be working. Some fans stated that everything started when Orpik hit Loui Eriksson, a sentiment echoed by Claude Julien. I can’t say if the hit was legal or not because I’m not skilled enough to decipher what the on-ice officials or Shanahan thinks is a clean hit. It seems to change from situation to situation, and player to player. The puck looked like it was almost on Eriksson’s stick, took a bad hop and Orpik levelled him when his head was down. I would offer the opinion that Orpik was guilty of taking advantage of a player when they were vulnerable. A hit at half the speed would have bumped Eriksson off of the puck, leaving him with a bruised ego instead of brain, and accomplished the goal of disrupting a breakout play. But that’s not good enough for today’s NHL teams who reward grit and toughness over respect for opponents. If you’re not willing to hit through someone and make them hurt, then there’s another 10 guys in the minors that would love to take your roster spot. A minority of the sports media pointed out that this was a chippy game from the very start and the refs did a poor job of controlling it. This was a game that also included Neal putting his knee into Marchand’s head and Kelly suffering a broken ankle from a slash from Dupuis. Some even offered the opinion that it would be rough before the puck was even dropped. Boston has a reputation for playing tough and are usually among the top teams with fights/game every season. Pittsburgh has been a chippy team for years and, based on my tracking of Rat PIM, are usually at the top of the list for teams who incur a lot of penalties related to roughing, slashing, elbowing and other “Rat type” infractions. Perhaps the league should be tracking which teams push the limits on officiating in terms of what types of penalties they take. Teams with a higher percentage of dangerous or cheap shot penalties should get extra scrutiny. Referees who work those games should receive a pre-game briefing on strategy to control the game and keep it from getting out of hand. If the zebras went into a contest armed with real statistics, instead of just their first-hand personal perception of players, maybe more games would be about hockey, not hacking. I think the “let em play” strategy has run its course. But the real culprit in this ugly incident has to be 40 years of history and development of a culture of violence. If you believe player surveys, every roster position on every team is filled with individuals who believe that a blow to the head will make the game safer. Referees can’t control a game that is full of players who feel entitled to take revenge for any slight, no matter who is right or wrong. Enforcers will invoke their privilege of face-punching the guilty or innocent and the officials will stand to the side until they are tired or concussed. Orpik and other hard hitting players feel compelled to deliver harder and harder hits in order ensure intimidation and contract bonuses. Thornton and his enforcer brethren will continue to guarantee a roster position by fighting each other and anyone else who is stupid enough to drop the gloves. 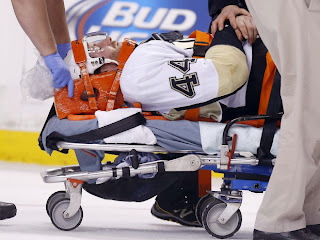 Coaches will continue to send out 4th line marginal hockey players who deliver truculence and injuries. And the league and team owners see nothing wrong with any of it. Those who fail to learn from history are doomed to repeat it. Probably in the very next game. Thanks for generous comments. I'm positive that there are more hockey fans who are tired of the fighting and level of violence that exists today in the NHL. Over the past 2 years, since I started this blog, I have seen increasing amounts of anit-fighitng comments on various social media. Over the past 6 months we are also seeing more NHL players and GMs, current and past, come out against the role of enforcer. Pro-fight fans are still far more vocal but I think change is now inevitable and within a few years we will see a game misconduct instead of a 5-minute major. To speed it up all of us who want to see fighitng reduced or removed have to keep the pressure on. Keep refuting the myths at every opportunity. 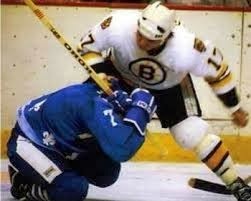 Direct your comments to the NHL and NHLPA where ever possible. Change may be inevitable but we can control the timing. I'm interested in your thoughts on the possibility of an assault charge. I have not heard this point come up in any media discussions about the incident. Orpik was attacked from behind and not engaged in a consensual fight. Could assault charges be laid is this case since he did not consent to fight or is the NHL legally exempt due to the rough nature of the game? The NHL is not legally exempt as players have been charged with assault in the past, going back to 1905. Don Maloney, Tiger Williams, Dino Ciccarelli, Marty McSorley and Todd Bertuzzi have all had criminal charges laid against them for on ice violence. Most have been acquitted or let off with minor fines or sentances, like community service. The police in the community have to believe that the charges are warranted and that there is a decent chance of success. I doubt the Boston police or justice officials are interested in prosecuting Thornton. You pose many questions that, as the other poster mentioned, are under-appreciated. This whole business of fighting and violence as a whole seems to be a polarized debate, so I value your questions and trust that folks who maybe are questioning their own stance will post their thoughts. What he did was uncalled for--or maybe it was by some fans. We can't have it both ways--if we crave the violence, we're going to have to accept that police are imperfect and will use excessive force. This is just another example of, like you said, a long history of cultivating hate and hypocrisy: Gordie Howe's lovable elbows, making rules to punish hits to the head yet promoting fighting, teams who tolerate their own rats but who decry opponents’ rodents, and fans banging the Plexiglas—and then going silent when a player goes down. This was an uncalled for attack, and has no place in the game. These type of attacks have always been penalized severely. To compare it to fighting is ludicrous - this will happen from time to time whether fighting is banned or not. What needs to happen re: fighting is: remove the intsigator penalty, and allow the rats to face punishment. No one dared to touch Steve Yzerman or Wayne Gretzky because if they did, it would be a big problem. That alone will clean up the game more than banning fighting will, because the stickwork and dirty play will skyrocket - causing many more injuries. I think you guys should stick to the dirtier Euro game, and leave the North American game alone. If I didn't like fighting, I would simply not watch - not compalin like little children, 99% of NHLers want fighting in the game. Leave it alone. Exactly, 99% of the players want fighting to remain in the game... if they take fighting out of the game the "Rats" will run wild and flourish. I don't think any of us want to see that. How do you get to 99% if the rats among the players would prefer fighting to go away, apparently? The fact is, many of the "rats" are also among the most frequent fighters, so you end up needing a guy like Colton Orr to protect the skilled players from guys like Colton Orr. Sorry but Thornton chased Orpik twice trying to engage him in a fight and was refused. He then cowardly attacked him from behind. The assault resulted from Thornton's frustration over not getting the fight that he wanted. You can't separate the result from the intent. You think Thornton put enough thought into his actions that he was afraid of the instigator penalty but not afraid to slew foot Orpik from behind and punch him while he was down. Amazing. And if you watched any hockey before the 1991-92, when instigator rule was added to the rule book, you would have see 4th liners attacking star players in an effort to get them off the ice for 5 minutes. That's why it was added to the rule book.